Where can a purchase a paper copy of the Zoning By-law? How current the information displayed in the Paperless version here versus the paper based version? Should I purchase a paper version? If I have problems using this paperless application, who can I contact? When you click on the Launch Zoning By-law button you will be redirected to another website. Orderline is contracted by the City of Mississauga to publish our Zoning By-law both online and in printed form. If you are experiencing display issues with various sections of the Zoning By-law, please consider using Chrome until we resolve this problem. 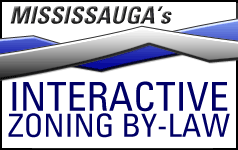 Please Note: Questions regarding interpretation of the Zoning By-law should be directed to the Zoning Section staff at the City of Mississauga. The City cannot be held responsible for the privacy or security practices of other sites. Before providing any personal information, be sure to read the privacy statement of each web site you visit. The Corporation of the City of Mississauga does not endorse or accept responsibility for the content of the Orderline web pages, nor is the City responsible for its accuracy. Please check with City staff for the most up to date information: please see the contact information below. The Corporation of the City of Mississauga shall not be liable for any claim, liability, costs, expenses and/or damages arising directly or indirectly from any use of Orderline's web site or information on that web site, including, but not limited to, discrepancies in the processing of credit card payments, content errors or any other mistakes. Documents displayed on Orderline's web site should not be used as an authority on which to base any transaction, including, but not limited to, real estate purchases, development proposals or building permit applications. No content or information contained in this copy of the document displayed via Orderline's web site is guaranteed to be current, accurate, complete or free of errors or of tampering. All content is subject to change without notice. Please check with City staff for up-to-date and accurate information: please see the contact information below. Due to the variety of different web browsers and printers available to the public, the Corporation of the City of Mississauga cannot be held responsible for incomplete or inaccurate data, material and information that may be received and/or displayed on any internet browser or produced by any printer. The documents and information on Orderline's web site are provided for convenience purposes only. The Corporation of the City of Mississauga shall not be considered to be providing advice on any matter including, but not limited to, development, building, real estate, investment, financial, legal, accounting and/or tax advice. The Corporation of the City of Mississauga recommends that you consult with your own professional advisor(s) with respect to your particular circumstances. The documents displayed on Orderline's web site are subject to continual amendment and revision. In the case of discrepancies between information displayed via Orderline's web site and equivalent information available from the Corporation of the City of Mississauga, information available from the Corporation of the City of Mississauga takes precedent over the material contained within Orderline's web site.